There is a push to encourage everyone to sign a health care proxy. For good reason. Medicine is increasingly able to prolong life, but not always quality life. Over treatment and under treatment concerns abound. People should designate someone they trust – a health care proxy – to articulate what interventions they want in life threatening situations, should they be unable to speak for themselves. While the concept of health care proxies is straightforward, their successful use is another matter. Proxy papers get lost. The designated proxy is not available or does not know the wishes of the patient. Loved ones challenge the directives. Hospitals are unable to locate proxies that have been filed with them. This topic has many complexities. This article focuses on one of the basic issues: making sure your health care proxy is easily found when needed. Although many people consider a health care proxy to be a legal document, it should not be filed where people typically store important legal documents, such as a safe deposit box or your attorney’s office. A health care proxy is your effort to communicate your treatment choices to health care professionals in an emergency or time sensitive situation. You should keep your health care proxy where it can be easily found. On a smart phone, using one of the many apps that are now in use, such as myhealthcare, DocuBank, mydirectives, EverPlans, or Aftersteps. A note a caution about electronic forms. Although they are considered to be immediately retrievable, they are not accessible if you are unconscious and no one knows the password. A smartphone is useless if its battery is dead, or it is lost. Hence the need for multiple copies. Nothing is fool proof. A good backstop is the simple wallet card or ICE app (in case of emergency). 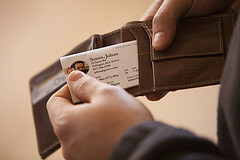 A wallet card can provide the name and phone number of your proxy or next of kin, which is a good start. The ICE app allows someone to get emergency contact numbers from a cellphone without any passwords. By taking the time to place copies of your proxy in places that you think are secure and known to others, you have greatly increased the likelihood that your preferences will be honored should the need arise.